All in all we rode about 20km with our bikes, not getting as far as we wanted. But we saw a new temple and being free to go just where we wanted and being back for sunset at Angkor Wat again was worth it. Driving here, especially on a bike, is an adventure on its own. Rules as we know them (right before left etc.) and traffic lights are rather guidelines than rules. Best way to get through the chaos is to follow the locals and just go. Everyone just drives like they want while still taking care of the others on the street. Noone ever really stops but somehow it works out just fine. Tonight we are going to leave Cambodia again with a nightbus to save us the money for another night in the guesthouse and to be back in Bangkok rather early so that we can travel on to the south hopefully the same day. 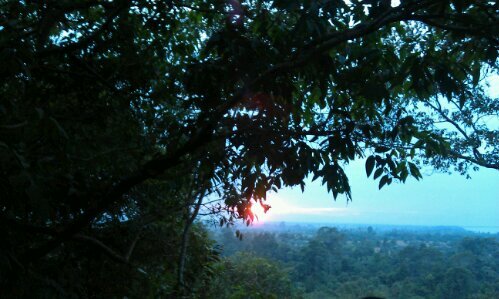 But before that we went to Angkor one more time. Today my legs were soar, the humid heat (I guess about 35 C) was bugging me and I still can’t really live with all those little kids at the temple entrances that try to sell things (“Sir/Lady, where are you from? Do you want to buy my postcards. Only one dollar.”). Not even biking through beautiful ricefields could really cheer me up. So overall I was a bit of a spoilsport today. But at the moment we are lying at the pool behind our guesthouse, relaxing a bit and preparing for our night trip back to Thailand. 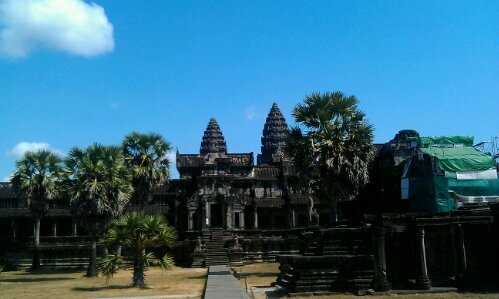 For everyone going to Siem Reap to see Angkor I suggest to really think twice how much you want to see. It’s all very beautiful and interesting, but also very touristy, masses of people walking around and having a Tuktuk driver for the day is super convenient but expensive. Going by bike is fun, but also exhausting. 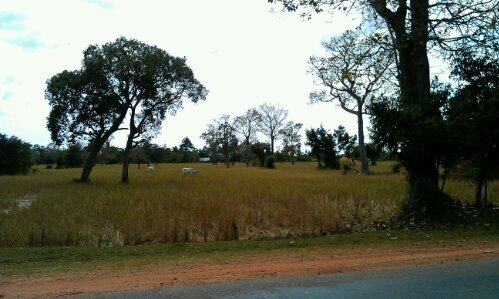 Overall, Siem Reap is quite expensive. If you can avoid it, buy nothing at the temples as prices are raving. But even in a normal supermarket, the cheapest water is $0.60 while the same water would be less than 1/3 in a German supermarket. Food in touristy places is $2-6, while we had breakfast today for two people at a local food market (some kind of curry noodle soup with vegetables) for $0.75. Summing it up, it was a nice but exhausting and expensive trip to Cambodia. Now we’ll be heading southwest to Thailand’s famous islands to relax a bit again. This entry was posted in Cambodia and tagged Angkor, Bike, History, Ruins, Siem Reap, Temple by kathatravelling. Bookmark the permalink.